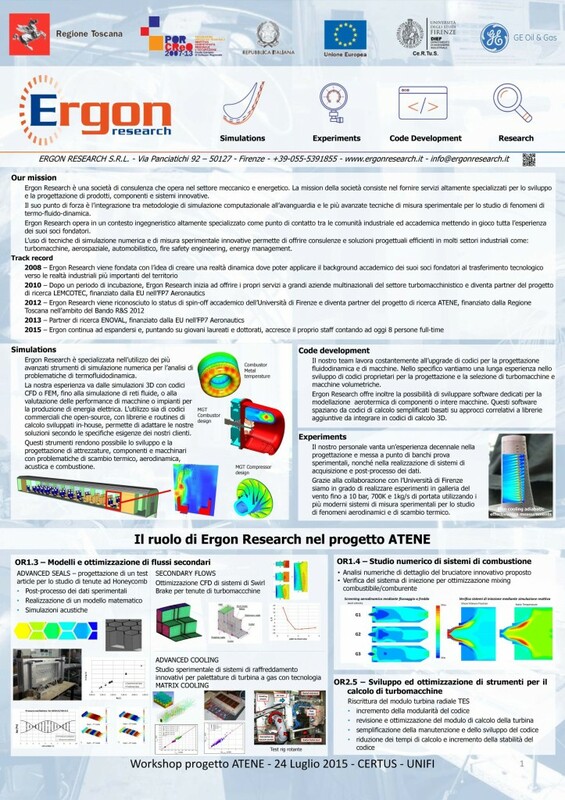 ATENE project aims at performance improvements for rotating and reciprocating machinery employed in the Oil&Gas and Industrial Power Generation industries. Performance improvements, also including power density increase and reduction of global production and testing process environmental impact, is achieved through a branched workplan. ATENE is structured on a network of SME and research laboratories distributed within Tuscany aimed at appraising local specific excellences. The consortium is composed by 16 partners with 5 research centers, 1 big enterprise and 10 SME. The structure of the proposal organized per technological areas and the network model generate 5 “virtual laboratories” each devoted to a specific Operative Objective. Ergon Research is involved in three different tasks about the design of innovative systems for the control of secondary air flows in turbomachinery (stator-rotor cavities, seals and internal cooling systems), the analysis of Lean Premixed combustion system and the implementation of new calculation models for turbomachinery performance prediction.